This directional guide will tell you how to go to Philippine Arena from different locations of Metro Manila as well as other nearby provinces. Philippine Sports Stadium is located adjacent to the humongous dome. Going to the exact location of Philippine arena by public transportation, e.g., bus, jeepney, and even in part by MRT/LRT trains is a breeze. Returning to Manila - also written. The largest indoor arena in the world is located at 75 hectare land owned by Iglesia ni Cristo at Bocaue, Bulacan. Specifically referred to as Ciudad de Victoria, the massive territory in which the world's largest dome arena majestically stands is bordered by NLEX itself. That said, you will have no trouble in going to the exact location of Philippine Arena as the giant iconic building is very visible from the distance. And as the bus or jeepney from Manila you're riding in passes by this architectural and engineering marble, you would think that you could literally walk right from the edge of NLEX straight to the gigantic dome and get there quickly. Well, if you can get off the vehicle on that spot, that is. First, go to any terminals of jeepney or bus headed to its location. Or along EDSA, go to the loading zone and ride the bus headed to its location. Second, alight at "Barangay Turo" or you can simply say to driver or bus conductor as "Turo" which is approximately 535 meters from NLEX ramp where the bus or jeepney bearing you and other passengers turn right after stopping at Bocaue Exit on its way to destination in Bulacan. A tall and wide metal arch is erected at the corner of the street perpendicular to the left of the main road you're taking from NLEX which is Gov F Halili Ave. Attached to the arch reads "Welcome Brgy Turo Bocaue Bulacan" and that's where you must alight. Third, go to the terminal or queue of tricycles that you would see not far. Take a trike and say your destination to the driver - "Philippine Arena"
The trike takes the narrow road perpendicular to the right of Gov Halili Ave which is just a little bit past the Brgy Turo welcome arch. It will take you right to the Philippine Arena. 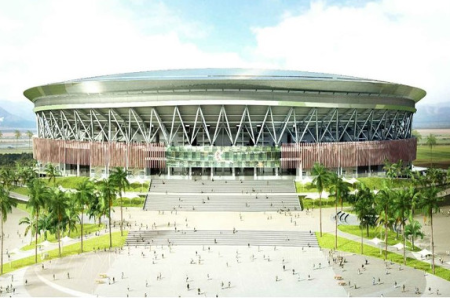 You can view the location map of Philippine Arena at the end of this article. As I have already mentioned, after getting off the jeepney or bus from Manila, you still need to take a trike to set foot on the ground of Philippine Arena. So, below are three different spots in Metro Manila where you can take a one ride route to Brgy Turo from which you take a trike to Philippine Arena. There are two terminals of jeepneys bound for Philippine Arena - via McArthur Highway and via NLEX. Forget about 'via McArthur Highway' as it takes long to get there. Take only the jeepney with route 'via NLEX' for fast commute. The terminal of jeepneys that take NLEX is located near LRT-1 Monumento Station. Exact location is Benin St corner Maximo St. The route and sign of jeepneys there is "Monumento - Sta Maria." From LRT Monumento Station, walk towards EDSA where Andres Bonifacio Monument is located. Turn right onto street before EDSA which is L Bustamante. Walk past a street perpendicular to the left and then turn left onto the next street perpendicular to the left which is Benin. Walk to the next corner on the left of Benin before EDSA, where the terminal is located. From Andres Bonifacio Monument aka Bantayog ni Andres Bonifacio and popularly known as Monumento, walk on the right of EDSA. Turn right onto the first corner from Andres Bonifacio Monument which is Benin. The terminal is located at the next corner of Benin St, on the right from EDSA. From footbridge of EDSA before Bantayog ni Andres Bonifacio (Monumento.) If you're in the northbound lane of EDSA (you have alighted from jeepney or bus from Balintawak part of EDSA), use the footbridge and cross EDSA. Walk toward Andres Bonifacio Monument and turn left onto the road before Andres Bonifacio Monument. Located below LRT-1 Doroteo Jose Station, exactly beneath the footbridge that connects LRT-2 Recto Station to LRT-1 Doroteo Jose Station. The route and sign of bus to take here is "Sta Cruz - Bocaue." From LRT-2 Recto Station, follow directional signs to LRT Doroteo Jose Station, use the footbridge. Don't cross to the other side of LRT-1 D Jose Station. Just go down the road once you get to Doroteo Jose train station. You'll immediately see the bus terminal next to the building of LRT Doroteo Jose Station, along Doroteo Jose St and just below the footbridge. From a Baclaran bound LRT-1 train, go down the D Jose Station. Cross Avenida towards the opposite corner of D Jose and Avenida. Go to the back of LRT D Jose Station via D Jose St and the bus terminal is there. From a Roosevelt bound train, go down to Doroteo Jose St, and go to the first bus terminal below footbridge of LRT-1 and 2. The most convenient spot to board a bus headed to the location of Philippine Arena along EDSA is at Farmers Plaza in Cubao. The bus has a lot of vacant seats there. During peak hours, it helps if you take the bus at this area. Other loading zones are located past Aurora Blvd, Trinoma, SM North EDSA, Roosevelt-Munoz and Balintawak. The sign of the bus to take is any of these: "Garden Bocaue Exit Sta Maria", "Sta Clara Bocaue Exit" and "Sta Maria Bocaue Exit." Just go out of Farmers Plaza and wait along the sidewalk in front of Farmers Plaza which is shaded by Farmers Plaza building itself. The bus passes through the lane nearer to the sidewalk. Option 1 - take a bus with secondary sign that reads "Cubao Ibabaw" and alight at Farmers Plaza. Then ride the bus to Brgy Turo in Bocaue. Option 2 (faster) - alight at MRT-3 Magallanes Station, ride train to Araneta Center Cubao Station which is connected to Farmers. Go down to the loading area and take the bus to Bgy Turo. Option 3 - take a jeepney with "Pasay Rotunda" sign, alight at Pasay Rotunda, ride a LRT-1 train to Roosevelt and alight at either Doroteo Jose or Monumento stations. Then go to the terminal of either bus or jeepney mentioned earlier. Terminal 1 & 2 - take a NAIA shuttle and and alight at Terminal 3 then ride the shuttle headed to Pasay Rotunda in Taft. Terminal 3 - go to shuttle bus bay and ride the train headed to Taft/Genesis Terminal. Terminal 4 - jeepney along Domestic Road, alight at Airport Rd. Ride another jeepney with "Nichols MRT/LRT" sign. Alight at Pasay Rotunda. Take MRT-3 train to Araneta Center Cubao and ride the bus to Bocaue Bulacan mentioned earlier. Option 1 - Ride city bus bound for Fairview via Espana, Lawton and UST. Alight at any point along the route with LRT-1 station. Ride a train bound for Roosevelt and follow Option 3 of Route #1. You can also take jeepney with "Sta Cruz Monumento" sign. Option 2 - Ride a city bus with "Cubao Ibabaw" secondary sign. Follow either Option 1 or Option 2 of Route #1. From Cavite towns and cities, i.e., Dasmarinas, Bacoor, Silang, Tagaytay, Imus, Kawit, etc as well as in Batangas City via Southwest Integrated Terminal. Ride a provincial bus to Southwest Integrated Terminal, then, follow directions given in Route #3. Note: If the terminal of bus you're riding from your provincial origin is located along EDSA such as in Kamuning, you can take the provincial bus headed to Brgy Turo. Just wait for that bus at loading area near the terminal of the bus you have ridden from Batangas or Cavite. There are lots of jeepneys you can take to EDSA. Look for "Malibay" bound jeepney at South Terminal which is just outside SM Store or SM Department Store. You can ride that jeepney and alight at MRT-3 Taft Station then take the train to Araneta Center Cubao Station and follow Option 2 of Route #1. If you prefer bus, then get off the jeepney at Heritage Hotel, then ride the bus with "Cubao Ibabaw" secondary sign. From Divisoria, Binondo, Lucky Chinatown Mall and areas nearby. Walk from Lucky Chinatown Mall to Recto Ave which is very near. In Divisoria, Recto is where ends. In Binondo, use a pedicab or if you can, then walk your way to Recto or take a jeepney headed to Divisoria in front of Binondo Church or nearby. Ride a jeepney bound for Cubao, Morayta/PRC, Quiapo or Marikina. Alight at Avenida where LRT-1 runs above. Option 1 - Cross Recto Ave and walk along Avenida until you get to Doroteo Jose. Now, take the provincial bus to Bulacan mentioned earlier in the post. Option 2 - Ride a train at Doroteo Jose Station bound for Roosevelt and alight at Monumento. Now, follow direction to the jeepney terminal which is mentioned also at the start of this post. Along C-5 Road, just outside Eastwood City, jeepneys bound for Cubao pass through. Take one of these jeepneys. In Cubao, walk your way to Farmer's Plaza mall. Once there, go to the frontage which is EDSA. Now take the bus to Brgy Turo. From Marikina, Antipolo, Angono, Cainta, SSS Village, Sta Lucia East, Robinsons Metro East, SM City Marikina and nearby places. You can take a jeepney or Urvan Express. You can also take a bus with "Quiapo" sign if there are in your area. If bus, alight at EDSA-Ortigas or Robinsns Galleria. If jeepney or FX, alight at either EDSA-Crossing or EDSA-Ortigas. Ask the driver if where he's headed. Either way is okay, as long as you're near EDSA. In EDSA, ride a bus with secondary sign that reads "Cubao Ibabaw." Now, take the provincial bus to Brgy Turo in Bulacan. From Central Temple of Iglesia ni Cristo in Commonwealth Ave Quezon City where New Era University College of Evangelical University is also located. Also from Quezon Memorial Circle, Quezon City Hall, Philcoa and other areas nearby. Ride a jeepney bound for "Roces", "Pantranco", "Delta", "Fisher Mall", "Quiapo" in any loading area located along Commonwealth Ave. Alight at the corner of Quezon Ave and EDSA. Use the pedestrian footbridge, cross Quezon Ave and go to Centris. Go to the bus loading area along EDSA and wait for the bus bound for Bulacan. Note: Some bus also stop at the spot along EDSA past Quezon Ave but it's not convenient to wait there because most of the time buses are already full. Buses stand longer at Centris area before crossing Quezon Ave.
From any station of LRT Line 2. You can get to Philippine Arena faster by using LRT-2 from your location along Aurora Blvd, Magsaysay Blvd or from Santolan Station. Legarda Station is the one to use from Sampaloc/Legarda area and Mendiola where university belt is located. Just take a train either to Recto Station (last station) or to Araneta Center Cubao Station, depends on what type of bus you want to take. Most buses in Doroteo Jose are ordinary while in Farmers Plaza/EDSA bus bay, buses are air-conditioned. Take the exit to Gateway Mall in Areneta Center and follow the directional sign to MRT-3 which is connected to Farmer's Plaza. Once there just go down to EDSA and ride the bus to Bulacan. From BGC or Bonifacio Global City - Market Market, SM Aura, Bonifacio High Street (BHS), etc. Take a BGC Bus bound for EDSA-Ayala at Market Market BGC Bus Terminal. If you're location is at west part of the BGC, just go to any Bus Stop located near you and take a bus with "West Route" sign, it returns to EDSA after dropping all passengers in all bus stops there while also loading passengers headed to Makati and MRT-3. Once in EDSA, ride a northbound train at MRT-3 Ayala Station and alight at Araneta Center Cubao Station. Get down to the bus loading bay in front of Farmer's Plaza and wait for the bus headed to Bulacan. UV Express via NLEX from SM San Fernando, Angeles, Dau, Tarlac, Pangasinan, Bataan. Look for the terminal of UV Express in your area and ask for the one headed to its terminal in Bocaue. Once you reach Bocaue terminal, just walk down Gove Halile Road away from NLEX until you get to the arch of Brgy Turo. Take a trike to Philippine Arena. Note: If you're riding a provincial bus bound for Manila, make sure to alight at Bocaue Exit, cross NLEX and walk further until you get to Brgy Turo arch where you a tricycle to Philippine Arena. If your point of origin is not included in this commuting direction to Philippine Arena, you can use the comment form below to seek my help. First you need to return to Brgy Turo the way you came. There's also tricycle terminal right at the spot where you get off the trike you would have ridden in going to Philippine Arena. Take one of those waiting tricycles and get off at Gov Halili where you would have alighted from the bus from Manila. Now wait for any bus bound for anywhere in Metro Manila, e.g., Cubao, Alabang, Baclaran, etc. Get off the bus at the spot along EDSA from which you would take the next ride on your way home if applicable. You can alight at any LRT or MRT station and take the train for fast commute. how about malinta exit from novaliches po? @ alexie aragon. You are welcome. And thank you for your comment. Kindly share this to others so that they too can find the easiest commuting direction to Phil Arena from their respective locations. @ istoy. Either W or E Service roads are served by jeepneys, FXs and small buses. Please see "which" has one bound for those destinations written in this guide. Sir pano po makakapunta ng phil arena from commonwealth templo central? @ Rufino Carino. Sakay po kyo ng jeepney to EDSA cor Quezon Ave. Byahe po ng Quiapo o Delta o Pantranco ang sasakyan nyo. Pagbaba nyo ng EDSA, punta na po kyo sa loading zone ng mga buses at pki sunod nyo ang direksyon na isinulat ko sa article na to. @ Rufino Carino. Your question is clearly answered in this directional guide article. Hi, do you know if there are fx or van going to phil arena coming from sm north edsa? We will bring my 2 y.o toddler with us.so it's more convenient than taking a bus ride. ay bawal po ang bata 7 years old pababa....nasa announcement po! @ Lovely. Please check out the FX Terminal located just below the Sky Garden and in front of SM The Block Bldg. Route #12 is recommended on this guide. Bus to Manila and alight at Bocaue Exit or at Turo mentioned then follow direction given. thank you for these informations...BASA MUNA PO YUNG IBA BAGO MAGTANONG! You are welcome and thank you as well. pano po papunta phil.arena galing Olongapo City? 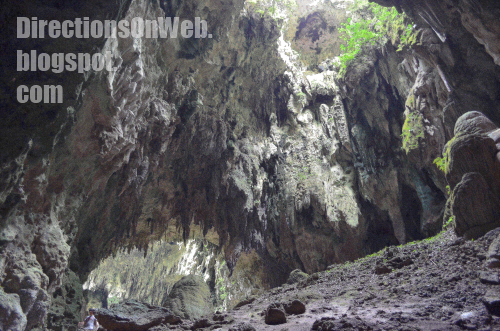 Please use route from the place nearer to Olongapo which I mentioned in the post, thanks. It's nearer. In that case, puj there and pub drivers can assist you.